Are patients in your waiting room reading the assorted magazines your staff has carefully selected? Or are they glued to their screens, checking email, catching up on social media, or playing Candy Crush? My guess, based on the pristine covers of magazines in waiting rooms I've visited lately, is that they're glued to their phones and tablets. Just how many hours a day are we spending looking at a screen? Apparently the average American is screen-fixated for more than 11 hours per day, according to a new Nielsen report. 11 hours! It's no wonder that we're seeing new problems crop up from our digital addictions. Electronic screens are slowing us down – we read 25% SLOWER on screens than when we read physical books or magazines, so we spend more time on a screen just to glean the same information. That extra time increases the eye strain that we're experiencing, but there's more than eye strain going on here. Viewing a computer or digital screen often makes the eyes work harder, in addition to working longer. The high visual demands of screen viewing make users of computer and digital screens much more susceptible to developing vision-related problems. 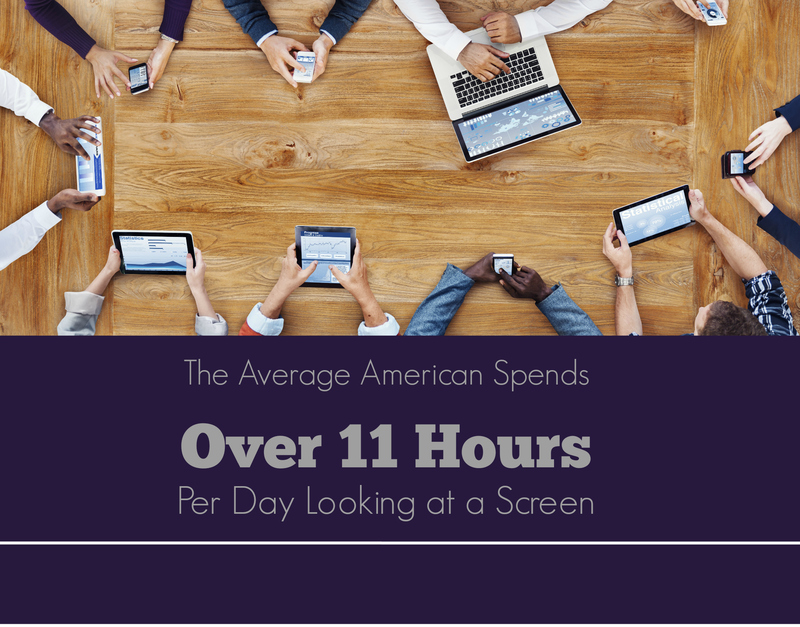 Those that spend 2+ hours a day with a screen (and remember, most Americans are spending 11 hours!) are highly susceptible to developing Computer Vision Syndrome (CVS), which is contributing to many unhealthy eye symptom. Many people don't even realize they're suffering because they've become so used to the effects of their digital addictions! Daily living with electronic devices of all sizes overworks the muscles that control your eyes. The eyes take in millions of bits of information, and we don't stop to think twice about the visual stimulation we're encountering. We are so used to holding screens close to our faces, making sense of pixelated images and screens with glare, that we don’t even realize that we're putting our eyes through a strenuous workout day after day! Such repetitive stress can cause great harm, and it's vital that we stop staring at our screens (not this second – this is important!) and think about how we can take care of our eyes, which are the gateway to our world! Fortunately, there is a simple but incredibly effective fix to help the constant eye strain we subject our poor tired eyes to, whether we are 3, 33, or 83. Simply put the 20/20/20 Rule into practice! The standard 20/20/20 Rule is: every 20 minutes, take a 20-second break and look at something 20 feet away. I've modified this simple tool for eye health in a way that will also boost brain fitness. We know that brain fitness has so many different components. I've talked previously about the need for movement and activity to help keep the brain fit, which in turn helps the eyes. This week, let's focus on keeping the brain active by working to maintain and increase eye fitness, because ultimately, eye health and brain fitness are intimately related. 20 – every 20 minutes GET UP and walk a few steps (or more) away from your electronic device. 20 – take 3 deep breaths lasting approximately 20 seconds each. 20 – look AWAY as far as possible for 20 seconds. Make sure you actually focus on the FAR focal point. Be sure to set a timer or alarm to beep, buzz, or ding to remind you to follow the 20/20/20 Rule. It may seem annoying at first, but bring it into your life, embrace it, and it will soon become a lifelong habit as automatic as brushing your teeth. Your brain and your eyes will thank you. Parents, teach this to your kids now, before they have all kinds of health and academic issues. Make it fun or even goofy – practice silly walks or making faces during the digital break, but be sure your kids take time to stare off into space (literally) instead of just focusing in on a screen mere inches from their face. Focusing all day on close screens “locks” some of our eye muscles, and just as you can develop hamstring problems from overuse at the gym, convergence insufficiency can develop from over-straining our eyes. Peering closely at a 3” screen has to be balanced with exercising our eyes with near-far activities. 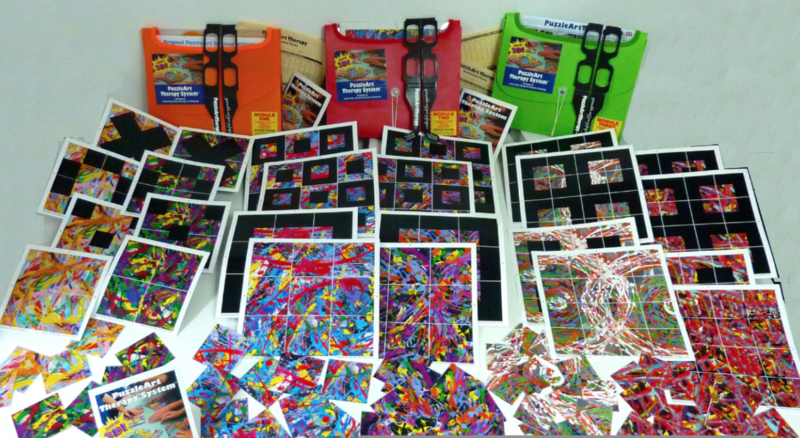 The PuzzleArt Therapy System has hundreds of activities to help develop and improve near-far ability and other visual skills that can lead to improved eye health and brain fitness. Take time today to step away from your device, breathe deeply, and look away (far, far away!) from all that draws you in on that digital screen of yours. The 20/20/20 fix is a great start to digital recovery and eye health! Alli Berman is a Brain Fitness expert and the Eye Brain Fitness Guru. She has been an artist, author, educator, creativity consultant, workshop leader, perceptual and sensory products and programs developer, and motivational speaker for the past 30+ years. Berman has served as an educational advisor to the American Academy for Anti-Aging Medicine for over 30 years, and she is the founder of The Art of Rehabilitation and Anti-Aging Art. She created the PuzzleArt Therapy System in collaboration with behavioral optometrist, Susan Fisher, OD, and through consultation with neuroscientists around the world. Berman uses the system herself on a daily basis to keep her own brain as healthy, engaged, and challenged as possible!